Researchers have identified a type of skeletal stem cell in the “resting zone” of the epiphyseal growth plate—a special cartilaginous tissue and an important driver for bone growth. Skeletal stem cells are valuable because it’s thought they can heal many types of bone injury, but they’re difficult to find because researchers don’t know exactly what they look like or where they live. 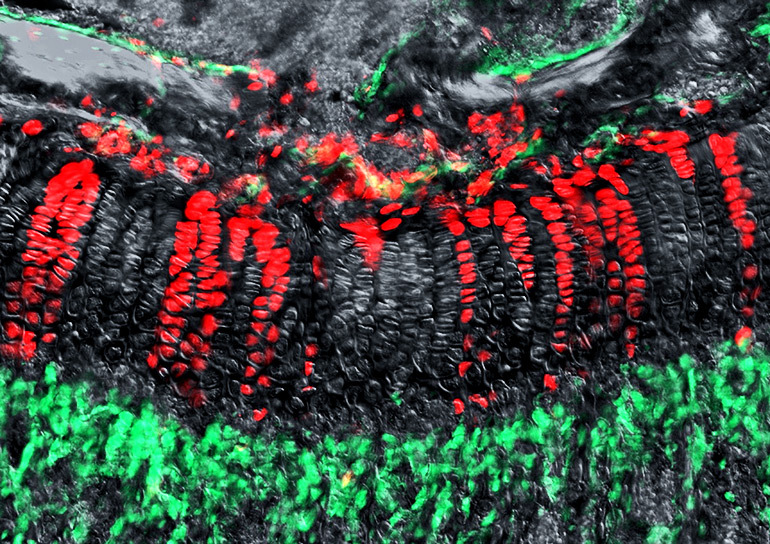 Locating skeletal stem cells in the resting zone makes sense because it’s widely believed that they stay quiet until they’re needed, says Noriaki Ono, assistant professor of dentistry at the University of Michigan. To find the cells, researchers used fluorescent proteins to mark specific groups of cells in mice and tracked their fate over time. In this way, they learned how the cells behaved in native conditions throughout the lifecycle, rather than on a petri dish, Ono says. The cells they found met the criteria for skeletal stem cells because they do some important things: They become cells that make both cartilage and bone, and they support blood cell production. This may be only one type of skeletal stem cell, Ono says, but it’s an important start. “Understanding these special stem cells in the growth plate will help understand why some types of bone deformities and fragile bone diseases can happen in some patients,” he says. The growth plate is composed of different layers, with the resting zone in the top layer. It’s long been thought that cells in the resting zone don’t divide, but researchers discovered that some cells in the resting zone wake up and start to make rapidly dividing chondrocytes–cells that produce “beautiful” columns (that look like a stack of pancakes) and maintain bone growth. Some of the cells in the resting zone go all the way from the top to the bottom layer of the growth plate, and some of them actually go through the growth plate and into the bone marrow cavity, creating osteoblasts (cells that make bone) and bone marrow stromal cells, which support blood cells. It’s been hypothesized for many years that chondrocytes at the bottom of the growth plate die, but the new findings show definite evidence that they survive and continue to make bone, he says. The findings appear in the journal Nature.